Worship is at the heart of what it means to be a Quaker. Meeting for worship brings us together in silence and spoken ministry so we can still our minds and open our hearts and lives to new insights and guidance. 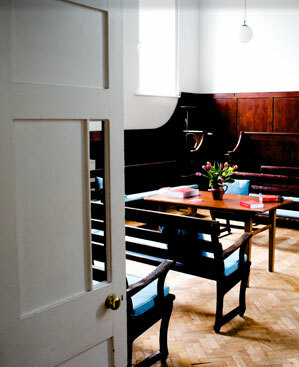 Meeting for worship at Brentford & Isleworth Quaker Meeting usually lasts for an hour and takes place every Sunday from 10.30 – 11.30. Everyone is welcome to join us. Advices & Queries, number 8. Children are very welcome at Quaker meetings. They join the meeting for worship with the adults usually for the first ten minutes, before going out for their own activities. These might be a craft or art activity, a story or drama. The focus might be on ourselves, the world about us, caring for others or aspects of the Quaker testimonies to simplicity, equality, truth and peace. Periodically an all-age meeting for worship might be held, based on a theme. The meeting has a Safeguarding policy and all members who are involved with the children regularly are DBS checked. Please let us know if you would like to bring children to meeting so we can be ready to welcome them. Contact the clerk Bessie White in the first instance. Children’s activities are run nationally at our national “Yearly Meeting”. Many teenagers enjoy attending national or regional residential events for young people. A Junior Yearly Meeting is held for 16 – 18 year olds.